Viceroy butterfly; photo by Dan Irizarry on Flickr (noncommercial use permitted with attribution / share alike). Viceroy butterflies are sometimes mistaken for monarch butterflies because their wing coloration is similar, but they are only distantly related species. 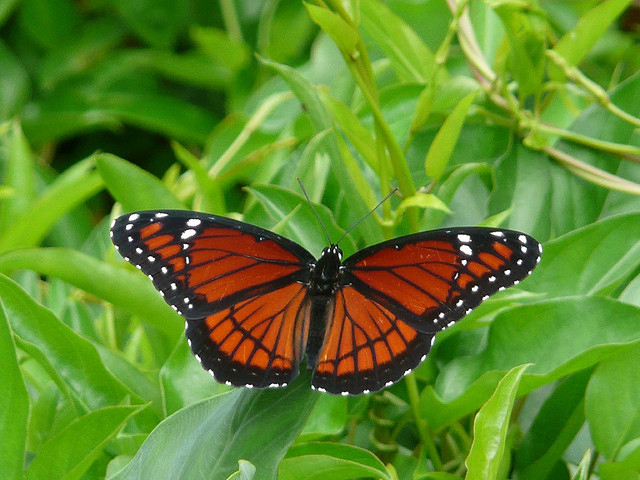 A viceroy butterfly is smaller than a monarch, does not migrate, and has a faster and more erratic flight pattern (monarch flight is more "float-like"). Native to North America, the viceroy butterfly's host plant is willow or poplar (Kentucky's state tree), and their emergence in spring is timed relative to the development of leaves on their host tree (the monarch butterfly's host plant is milkweed).